Union thugs: “I’ll kill the motherf*cker with a gun!” Violent left…what’s new? Why can't Buffet pay the taxes that he already owes? 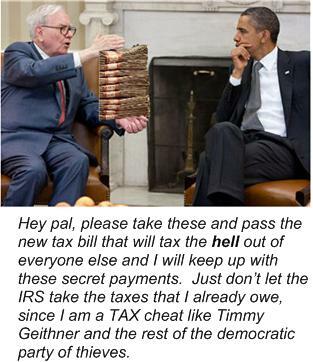 [...] They promise they’ll work it out with the IRS within the next year. Can’t Buffett just take a little out of his piggybank and pay up? For a man who so actively preaches honesty and integrity, we’re a little baffled as to why Berkshire won’t just fork over what it owes. Right-to-work legislation has passed in Michigan, despite the vociferous protests of bused-in union protesters in Lansing and sympathetic coverage from the liberal media, who have portrayed right-to-work as a blow to "union rights" as well as a "politically unnecessary" and "divisive" move by Republicans who control the state legislature and governor's mansion in a state that went strongly for Obama last month. But there is another side of the story, which the liberal media outlets are seemingly ignoring. The Michigan-based conservative think tank called the Mackinac Center for Public Policy has not only published persuasive and thoroughly-researched reports advocating for the right-to-work policy, they are doing their best to inform the public with the facts and figures that the majority of the media refuses to acknowledge, much less verify. For example, Mackinac has reported on how the public employees union SEIU has skimmed off the dues from its ailing and disabled clients' Medicaid subsidy checks to the tune of $33 million since 2006. The vast majority of which has been used solely for political advocacy. Gov. Rick Snyder and his attorney general Bill Schuette tried to put a stop to it by signing a bill into law earlier this year, but the SEIU has reportedly continued to do so, according to the skimTracker. When it takes effect, the right-to-work bill will finally allow members to withdraw from the union on the grounds of its ongoing improprieties. Steven Glossop moved back in with his mom Linda four years ago after she had a stroke when she was recovering from heart surgery. She needed constant care and he knew he would provide it. When he has to run errands or go to work, he arranges for someone -- often his wife -- to stay with his mother. To the Service Employees International Union, the Glossops are just another chance to make a buck [...] The Glossops, by virtue of getting Medicaid money from the state, are now members of the SEIU thanks to a unionization scheme orchestrated in 2005 when Jennifer Granholm was governor. Liberal media outlets like MSNBC have primarily allowed opponents of the law to state their case, while giving short shrift to right-to-work supporters and their own arguments. Even as its sister network, CNBC shows that Michigan is 33rd out of 50 on the "best states for business list." By contrast, nine of the top 10 states on the list have already adopted right-to-work laws. In a sluggish economy, that speaks volumes. Violence and threats… what else would you expect when Democrat State Representative, Douglas A. Geiss says, “There will be blood” on the Michigan House floor in reaction to Michigan becoming a right to work state. Outside of the Michigan state capital, anti-right-to-work protesters gathered. Among the crowd was supporters of the right-to-work decision. That is where the union thugs did what they do best- shout down, beat down, and attempt to neutralize opposing views. When conservative comedian/writer Steven Crowder began asking “man-on-the-street” questions about their views on right-to-work, he began to be shouted down, and eventually assaulted. Crowder was visiting a tent set up by pro-right-to-work Americans for Prosperity (AFP). Michael Moroney, Director of Communications at Franklin Center for Government & Public Integrity told The Blaze, “The union members went inside the tent to cut the ropes and knock down the poles that were holding the tent”. When Crowder tried to calm union protesters, and stop them from collapsing the tent where woman and children were taking cover, Crowder was then physically attacked, and then sucker-punched several times- all caught on video. As Crowder tried to take cover, a man could be heard saying, “I’ll kill the motherf*cker with a gun!”. What’s the old saying, “Look for the union label”? Let’s lay some things out on the table and get honest America. Violence and unions go together like hotdogs and mustard- where there’s one- the other will soon follow. It just is what it is. We get it, not all union members are violent, nor even have a desire to be in the union they are forced to pay dues to. Let’s say that again- nor have a desire to in the union they are FORCED to pay dues to (Right-to-work will stop that). But it is time that Americans stop looking the other way. Many are turning the cameras in the direction of the thugs, and exposing them. It seems like no matter how many mobs of union thugs kick, punch (a woman), and gang up on those who don’t share their point-of-view, the mainstream media (MSM) still looks the other way. That is, unless the event is a Tea Party. It doesn’t matter how much video footage MSNBC sends back from their satellite truck of grandma and grandpa sitting on their picnic blankets singing God Bless America, the story has already been written- “Angry Tea Party see blood!”. It would almost be funny, if there wasn’t a segment of our population that buys into their propaganda. On one side we have a prayerfully peaceful group of citizens marching for liberty and freedom- the Constitution. Veterans, children, and grandchildren- leaving the ground cleaner then when they arrived. The other side- we have grown men throwing sucker punches at unsuspecting people, while their mobs tear down, and collapse tents full of woman and children- all the while yelling, “I’ll kill the motherf*cker with a gun!”. Their is a long, and well-connected history between the American labor movement and the communism/socialism, and violence.